Unpaved street with an open ditch in the middle. This ditch was used to channel waste, taking advantage of the rain and the slope of the Eastern Mountains of Bogotá. Towards the end of the nineteenth century, the city faced an urgent need for new infrastructure, owing to the demands of transforming its image and the living conditions of its inhabitants. The modernization of Bogotá necessitated the transformation of public and private spaces following European and North American paradigms of hygiene, ornamentation, and morality. While the city grew in population and infrastructure, the volume of waste produced by the population increased too. Waste materiality and placing in the urban setting changed rapidly. New industries sprang up: cement, textile, and paper plants joined the late nineteenth-century industries of glass, beer, soap making, and food processing. 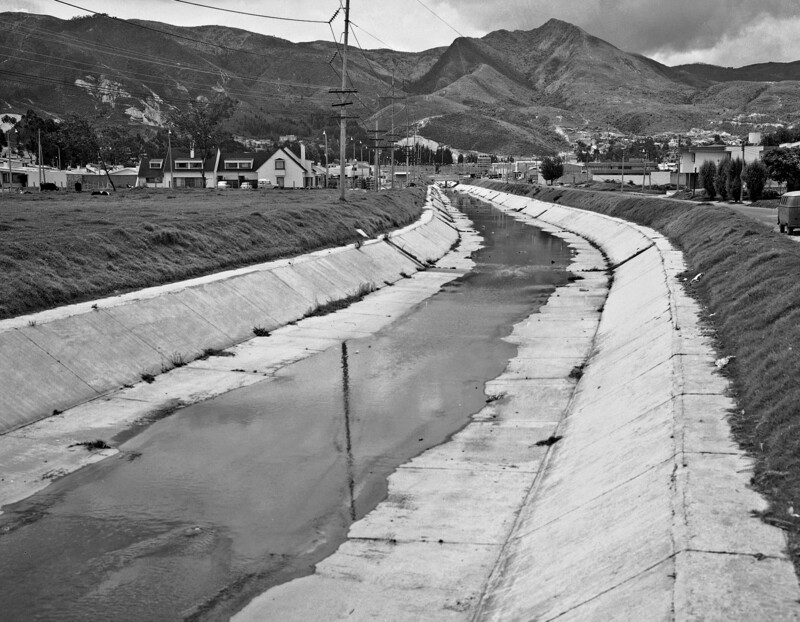 The industrial capitalist economy brought not only the settlement of a new working class in certain urban areas but also resulted in challenges to the urban rivers that played fundamental roles as part of the waste system. This initiated a technology-driven process of water domestication that was parallel to the intensification of water pollution. Outbreaks of typhoid fever are related to insufficient hygiene and sanitation infrastructure. Contaminated water, used for irrigation purposes or drinking, is the main cause for the occurrence of typhoid fever epidemics affecting all age groups. Since the supply of drinking water was inadequate in the urban areas in which they settled, the migration of rural people into the city was also a problem. Another epidemiological factor was the weather: in the dry season the accumulation of waste and flies played an important role in the dissemination of the bacillus. Cristóbal Bernal. “Estadística de mortalidad por enfermedades hídricas en Bogotá, de 1912 a 1922.” Santafé y Bogotá 1. no. 6 (1923): 395–99. Dabney H. Maury. Estudios sobre el abastecimiento de aguas para la ciudad de Bogotá. Bogotá: Editorial de Cromos, 1929, 17. Designed by Mónica Páez Pérez and María José Castillo Ortega. Tangrama, 2014. Water has played a key component in the clearance of urban waste since colonial times. Until the last decades of the nineteenth century, the main method of clearing out waste was to dump it into surface gutters, where it lay until rain showers drew it out of the city, as one traveler witnessed. The waste’s journey as it weaved through the steep togography towards the western plains of the Bogotá Savanna was an unrecorded but crucial actor of such a waste disposal event. The demand of the growing population and changing economy on river basins lowered the volume of water that supplied fountains and aqueducts, thus reducing the volume of water that transported waste from streets to rivers. The appearance of the rivers and the quality of their waters began to deteriorate, and citizens’ health worsened. 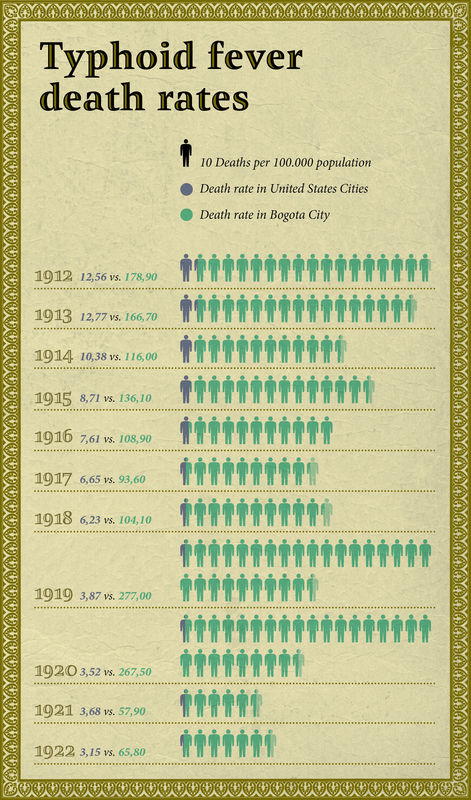 Figures showing the spread of waterborne diseases serve as dramatic indicators of how serious the epidemic problem was for the population of Bogotá at the beginning of the twentieth century. Two of the most common infectious diseases were typhoid fever and dysentery, both of which were transmitted through the ingestion of food or water contaminated with feces from an infected persons. The bacteriological theory, adopted in Colombia around the latter part of the 1910s, replaced the theory of miasma as an explanation for disease transmission, and drove engineers’ and physicians’ attention towards biological pollutants in water rather than its color and odor. Water chemical treatments and the urgent need for more modern infrastructure to improve the city’s health became the driving forces of the city’s political agenda. The ideal of the hygienic city found a powerful mechanism of irradiation in events such as the Pan-American Conferences of Hygiene. Colombian delegates participated in several of these, most notably the Washington meeting in 1926 because of its influence on sanitary politics, later adopted in major Colombian cities. One of the most far-reaching measures was the implementation and expansion of the domiciliary aqueduct service. This modified not only the hygienic conditions of the city but also the relationship of its inhabitants with water. 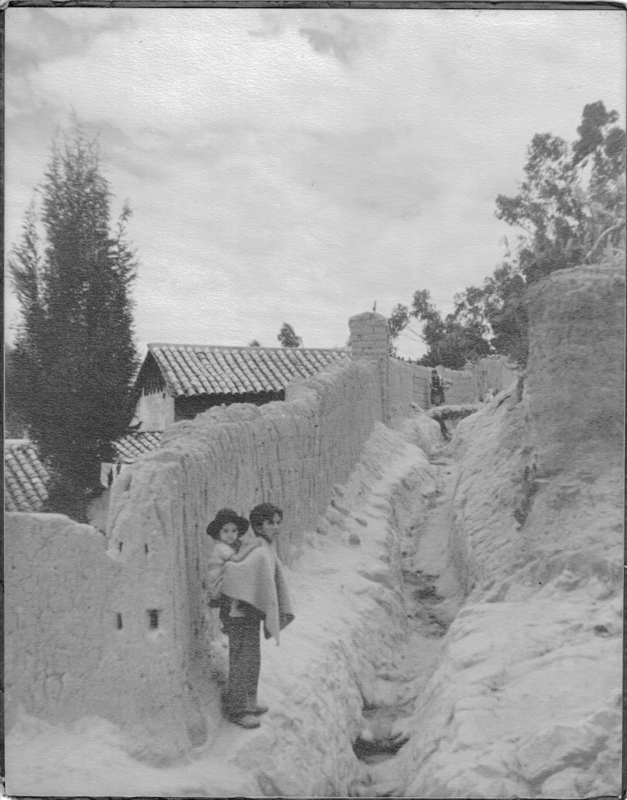 The liquid that could be used and consumed was the only one that underwent a “civilization process.” Rain and wastewater, once a cornerstone of the relationship between Bogotá society and water, was by this point progressively conceived as unnecessary, undesirable, and eventually dangerous to urban life. The other main urban modernizing project was the construction of an underground sewerage system. Due to the scarce municipal funds available, construction had to be undertaken by the owners of the land that benefited from the service. But even the municipality could not coordinate the works and as a result, sewage regulation was weak, defective, and incomplete. Luis Alberto Acuña, Canalización río San Francisco (1), 1910. The rivers play key roles in the waste evacuation system in Bogotá. From the first decades of the twentieth century the solution to the bad smell and unpleasant appearance of the rivers was to channel them. This shows the channelization works of the San Francisco River. Luis Alberto Acuña, Canalización río San Francisco (2), 1910. Channelization of the San Francisco River. Luis Alberto Acuña, Canalización río San Francisco (3), 1910. Luis Alberto Acuña, Canalización río San Francisco (4), 1910. Luis Alberto Acuña, Canal río San Francisco (1), 1930. Luis Alberto Acuña, Canal río San Francisco (2), 1930. Bogotá, Museo de Bogotá, Collection Luis Alberto Acuña, Reference MdB0082. Luis Alberto Acuña, Canal río San Francisco (3), 1930. Besides depicting a phase of the channelization works of the San Francisco River, this image presents the urban landscape, with the eastern mountains in the background and trees such as eucalyptus, pines and cypress along the river. Luis Alberto Acuña, Canal río San Francisco (4), 1930. On the social discipline battlefront, the municipal authorities challenged long-lasting waste disposal practices. They prohibited dumping in rivers, and determined that home garbage could only be placed outside buildings at specific hours for collection. The implementation of modern hygienic practices was met with resistance in certain sectors of the city and society, as in most of Western history. After all, modernity was a political program with a specific class and social order agenda. Small bridge over the channelized Arzobispo River. Built next to the channeled rivers were squares or roads following ornamental, hygienic and mobility purposes. All rights reserved. Biblioteca Luis Ángel Arango. Banco de la República de Colombia. Courtesy of Mario Cuéllar Bobadilla. However, Bogotá citizens began to associate sewage and sanitary measures with aesthetics and comfort, and so the demand for such services increased. Economic improvements that followed in the subsequent decades were driven by coffee exports that gave both national and municipal governments more funding to get involved with urban economics by authorizing loans and hiring foreign experts—mainly from the United States—to stimulate a transfer of technology. This not only refers to engineering knowledge but also to model management. 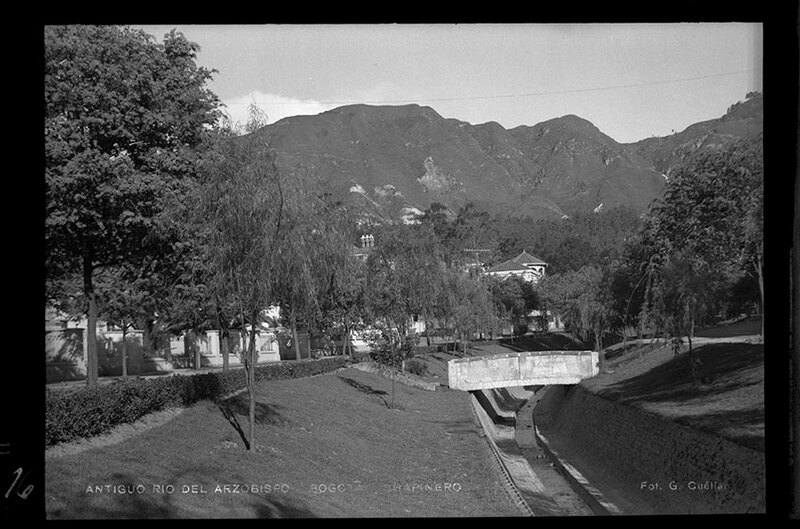 In the 1940s the management of the sewage system was progressively centralized and the Department of Public Works (Secretaría de Obras Públicas) was created to handle the waste system in Bogotá. This institution, instead of focusing on solving immediate and urgent needs on the matter of waste recollection and wastewater treatment, struggled to create an ambitious plan for the city’s future. By the mid-twentieth century, the sewerage network only covered a third of the city, 40 percent of which was useless. The institutional solution came only in 1967, when the Aqueduct and Sewerage Company of Bogotá (Empresa de Acueducto y Alcantarillado de Bogotá), created in 1955, carried out their “master plan” of construction for the city’s sewer system, which was concluded in the 1970s and equipped the city with underground sewers. This, however, did not disrupt the rivers’ key function as part of the waste disposal system. Waste pipes were built so that residual water flowed straight into the streams. Their consequent polluted state changed the perception of Bogotá inhabitants of urban rivers as health threats and obstacles to modernization. Channeling and diverting urban rivers to place them out of sight and smell was the solution prompted from the second decade of the twentieth century. The first targets were the San Francisco and San Agustín rivers: terrains adjacent to the channeled rivers were paved and became urban avenues and squares with ornamental, hygienic and mobility purposes. They were then transformed into collectors integrated to the sewer system, finally expelling their load outside the urban perimeter when they reached the Bogotá River, the main stream of the Bogotá Savanna. The Bogotá River, which receives tributary streams from the capital by bordering the city’s western limits, is today considered one of the most contaminated rivers in the world. Its source is located at 3,400 meters above sea level (MASL) in the Alto de la Calavera in the municipality of Villapinzón, northeast of the Cundinamarca area. 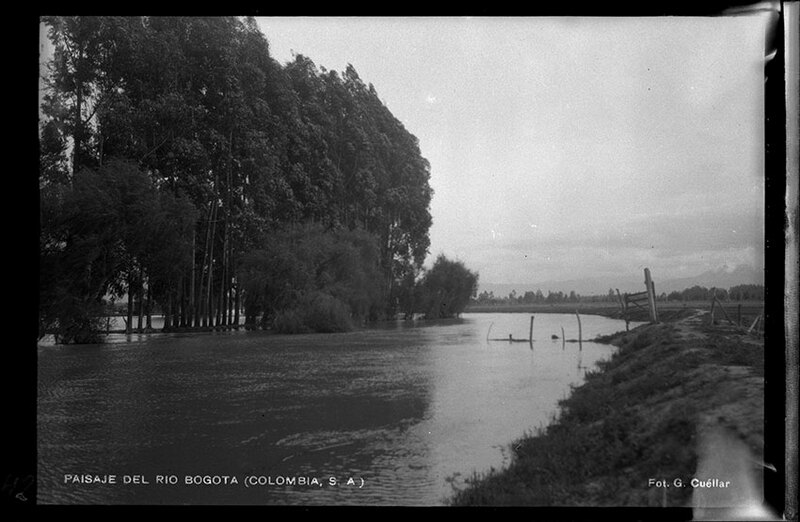 The river passes through suburban and rural areas of eleven municipalities of the Bogotá Savanna for approximately 150 kilometers before entering the city from the north. In passing through the city, its stream receives pollutants from the Salitre, Fucha and Tunjuelo rivers, and upon leaving it travels through the Soacha municipality where it receives the polluted waters of the Soacha River. It then descends to its mouth almost 300 MASL to the Magdalena River, the country’s main fluvial artery. Wide rainwater channel flowing through a newly-created neighborhood in Bogotá. The rate of pollution of the Bogotá River increases as it gets closer to the city. In its high basin the river currently receives waste from various tanneries and quarries, from agricultural and floricultural activities that use pesticides and fertilizers, as well as load releases from the sewers of municipalities and industries. In 1998, Bogotá was responsible for over 90 percent of the pollution load of this stream, derived from often toxic residues from urban industries—food products, chemical substances, leather, beverages, textiles, iron, steel—and oil stations, besides household waste. It is estimated that the Bogotá River pours into the Magdalena River 318 kilograms of chromium, 278 kilograms of lead, 140 tons of iron, 111 tons of detergent, and 835 tons of suspension solids on a daily basis. The history of the river’s pollution mirrors that of the city, including its exponential population growth since the mid-twentieth century with a dramatic increase in solid household waste, industrial development with few—if any—environmental controls, the growth of intensive farming, including the pesticide-intensive flowers cultivation, and the raising of cattle in the Bogotá Savanna. The capital city positioned itself as the center of Colombia’s economic development and as a refuge for rural people escaping from political violence and later armed conflict in the 1950s, and soon the city began to receive huge waves of immigrants. This posed greater pressure on authorities to find fast ways to dispose of the increasing volume of waste. “Wastewater flowing through filthy deep ditches even inside urban perimeter (Salitre River, San Francisco River, Albina Rivulet, etc.) is a shame for any city considers itself to be civilized. The dangers to the hygiene and health of Bogotá’s population are countless, more so considering that with these pestilent waters saturated with all kinds of viruses and pathogenic bacteria will be irrigated vegetables from many crops located west of the city, and that with those same sewage liquids many cattle farms supply their needs. Under these conditions, milk pasteurization and other hygienic measures for the control of ailments result derisory, if the big evil, the permanent origin of every infection continues without the interest of someone on its remedy. Or at least, no one with the means to act”. The consequences of river pollution can be dramatic for humans and other life forms. In the Bogotá River, high concentrations of toxics have led to severe eutrophication. Ichthyofauna has disappeared from most of the stream, particularly from the mouth of Juan Amarillo to the Magdalena River. Likewise, the polluted waters from the Bogotá River have been used to irrigate farming and cattle ranching areas of the savanna, transferring their toxic content—particularly mercury and chromium—to the common food sources of most of the inhabitants of Bogotá. For instance, up to 2.2 million coliforms and 7.4 million in total microorganism number (from 100 milliliters) have been found in milk produced from pasture landscapes irrigated with water from the Bogotá River, affecting health across the population. 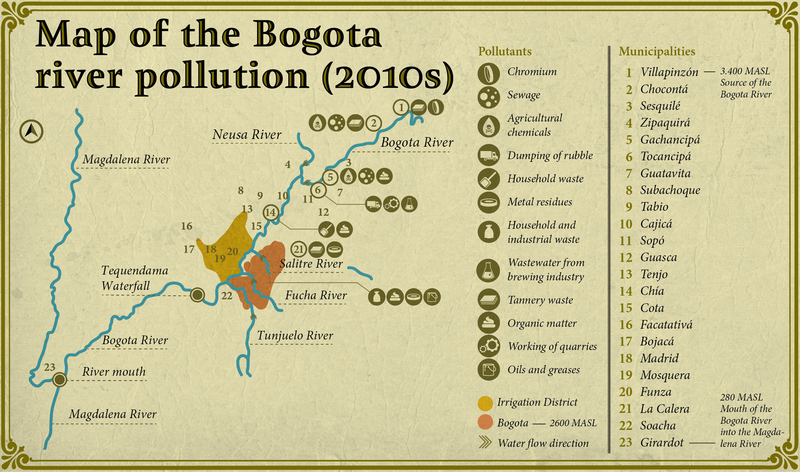 Infographic showing the characteristics of the pollutants recently loaded in the Bogotá River along its course through the Bogotá Savanna. Casa Editorial El Tiempo. 4 Años para salvar el agua de Bogotá. El Tiempo.com Multimedia, 2013. Accessed 23 November 2013. Eduardo Uribe Botero. The Water Treatment Plants of the Bogotá River: Case Study. In Documentos CEDE 8 (2005): 7. Accessed 2 December 2013. Pollution also put an end to recreational traditions such as trips to rivers for swimming and sightseeing, once very much celebrated by travelers and locals. An important symbol of this cultural and environmental loss is the transformation of the Tequendama Waterfall (Salto de Tequendama), a majestic waterfall located approximately 2,400 MASL, 30 kilometers southwest of Bogotá. Once a tourist attraction and an object of regional pride, acclaimed for the purity of its waters and the grandness of its view, the waterfall is now a striking spectacle of the dramatic environmental degradation of the Bogotá River. Visitors are no longer attracted to the breathtaking sights because of the shocking smell of the dark waters. 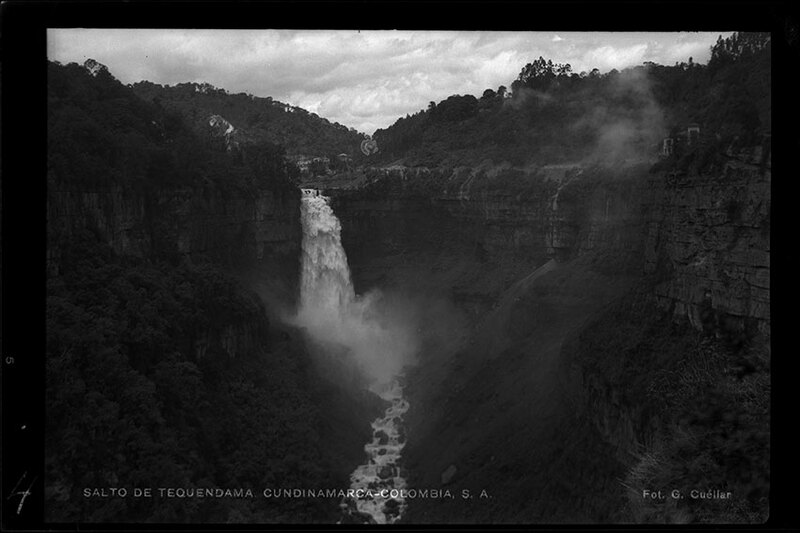 Gumersindo Cuéllar Jiménez, Salto de Tequendama. Cundinamarca, Colombia, S. A. All rights reserved. (Photographed by Gumersindo Cuéllar Jiménez). Biblioteca Luis Ángel Arango. Banco de la República de Colombia. Courtesy of Mario Cuéllar Bobadilla. Floods caused by waterways such as the Bogotá and Tunjuelo rivers happen almost every rainy season. This image shows the effects of regular overflows of the Bogotá River on farms located in the Bogotá Savanna, west of the city. In the 1970s, when environmental movements began to gain momentum and environmental legislation improved, pollution of the Bogotá River became a matter of political and public concern. Nevertheless, it was only in the 1990s that the municipal administration outlined a strategy for river sanitation by signing a contract with the French consortium Dégremont-Lyonnaise des Eaux for the construction and operation of three wastewater treatment plants in the mouths of the Salitre, Fucha, and Tunjuelo rivers. The objective of this project was to obtain a 40 percent reduction in organic load and 60 percent reduction in suspended solids through the primary treatment. Upon the second treatment, it was expected to achieve a biochemical oxygen demand (BOD) effluent of a maximum of 20 milligrams per liter and a volume of suspended solids of a maximum of 30 milligrams per liter. The project is still running, but only the Salitre Wastewater Treatment Plant has functioned since 2001. These measures did not focus on prevention but on the use of technology to diminish the problem. The natural cycle of water was later replaced by depuration technology. In 2010, a cooperation agreement was signed by the Colombian national government, the Department of Cundinamarca—the region where most of the Bogotá River flows—, and the city of Bogotá, aimed at constructing the treatment plants and accomplishing the decontamination of the Bogotá River in a 20-year timespan. Each of the recent mayors agreed that rescuing the Bogotá River must be a top priority on the municipal political agenda. Nevertheless, the intense pollution of this stream continues. Solutions have been proposed but not carried out, partly due to the enormous costs of wastewater treatment plant construction. Only recently has more attention been paid to pollution prevention rather than treatment at the dead end. Although new legislation for controlling industrial and public sewer system dumping has been enforced, the reality is that the Bogotá River continues to be a magnified example of the polluted result of the development model that the region pursued.